Why no pews in our church? I am asked on occasion, usually by someone who is visiting the church after a long absence why we took out the old wooden pews from our church. In truth there was a good reason and I feel one that is grounded in who it is we perceive ourselves to be as a part of the family of God. The pews themselves were not terribly comfortable as they were not originally meant to be a focal point of the church. Roughly constructed of wide boards and sporting a slightly artistic curved arm rest at each end and in the middle they were made bearable by the old maroon horsehair cushions that lay across the seats. With time even the cushions themselves became compacted and soiled and really had seen their last best days. For several years prior to deciding to remove the pews we had left the sanctuary each fall and winter to worship across the street in our Fellowship Hall which was smaller, had bathrooms, and was much less expensive to heat in our New York winters. Each November we would announce the annual move across the street, hoping to return in time for Easter if the weather was favorable. And each time we went across the street we formed our worship space as a tight circle around a space for the pastor and the music team. Worshipping in close quarters such as this was very intimate and a comfortable setting for those who came in on those cold winter mornings. In addition we had always felt that stewardship or faithful caring for the blessings we had was an important part of our ministry and witness. It just seemed wrong-spirited to heat up the sanctuary (which had to be started on Saturday) just for an hour’s use on Sunday morning. I always felt that it was not right to keep a building open and heated for only 52 hours a year. 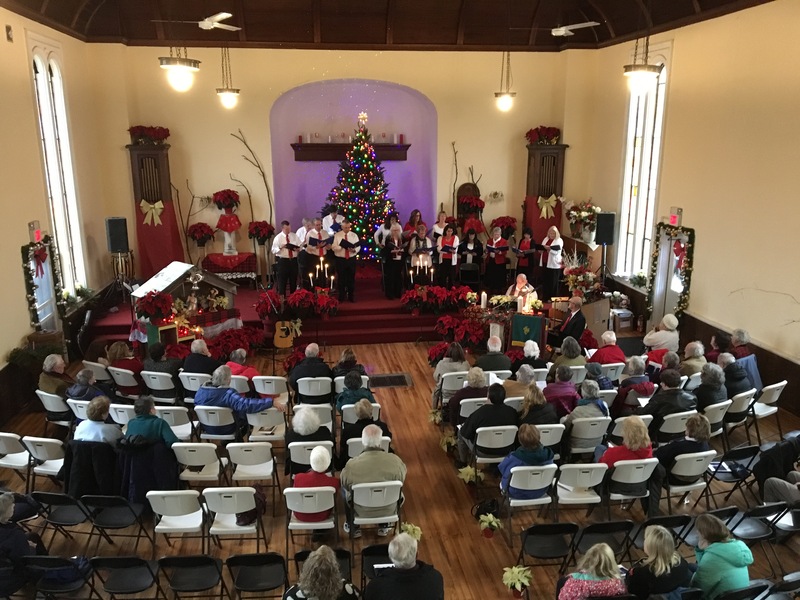 The time came however when our congregation grew larger and a new spirit of enthusiasm and energy prompted us to reconsider finding a way to worship once again full time in the sanctuary. An understanding was adopted by the Council of the church that if we moved back in we also needed to commit to finding ways to utilize the space more fully, to multi-purpose it so that it could fulfill other needs of the church and perhaps of the community. Options for using the space in other ways however were severely limited by the old, dusty, fixed, uncomfortable pews. In truth, we had gotten used to, and preferred worshipping ‘in the round’ which was also not possible with the pews which gave each worshipper a view solely of the pastor and of the back of the head of the person sitting in front. Gone would be the family style sharing and worshipping we had become accustomed to. And so the decision was made to pull out the pews, to sell them if possible, to pull up the old carpet and to sand down the floor in order to open up the possible uses of the space and allow us once again to worship as a family in our preferred fashion. And as we prepared to move back into our ‘new’ space, we realized that the almost two hundred years of having people sit in those old pews had left an indelible mark on the floors. Countless snowstorms and the dust of old carriage roads had caused the space between where the pews had been to become a testimony of all those who had come before us into that space, now re-consecrated for us as even more holy. And so, as we gather to worship, host café style musical events, celebrate ‘Christian Seders’ during holy week around a common table, and practice many other non-traditional ways of being community in the sanctuary, we give thanks for the guidance that has allowed us to be able to share this our sacred space.